Pontoon is a variation of blackjack, while also being a variation of itself. Confusing, but basically in the realm of online gambling, Pontoon exists as a variation of blackjack, while in land-based casinos around Australia, Pontoon is what American players call Spanish 21. You may also hear it being called Australian Pontoon. There are Spanish 21 titles available online, however these are not the pontoon titles we are discussing in this article. So to be clear, this article is talking about the online version under the title of Pontoon. Offered at an array of internet gaming establishments, Pontoon is a different take on the original 21 with rules which may or may not appeal to you. Give Pontoon and an array of other blackjack variants a try at All Slots Casino. If you have played 21 before you should be able to pick Pontoon up quite quickly, though some rules differ. The game begins similarly with players placing their bets on the virtual table. Then they must click on the deal icon and the player’s two cards will be dealt face up. The dealer will then deal their own cards, and this is where the changes begin as the cards are dealt face down. The rule variations don’t stop there in Pontoon with many altering from the standard game of 21. The payout is even different with the game paying two to one, even if players take the bold move to split. There are usually eight 52-card decks, and while all have the same card value as they do in blackjack, there are slight differences when they are being played. A pontoon is just like 21 with an ace and any card valued 10, however it is also included after splitting. Two hands of 21 after splitting also counts as pontoon. Any hand that has a value of more than 22, just like blackjack, means the player loses. When a hand totals 21 points or under with less than four cards don’t bust at the end of the round and then each players who have this are ranked in accordance to the value of their hand. This is where a player has five cards but doesn’t bust, meaning all five card tricks have the same value and the total value is not counted. Getting this is like getting a pontoon and it pays two to one. Player can stand on 15 or higher, as well as on any five card hand. Players can hit whenever they wish, even after doubling. The player can only double once during a hand, on two to four cards, and they can do so after splitting. Players can split up to three hands, meaning they can split but then only re-split once more. Players may only do this action when they have split aces. All cards are dealt face up to players and face down to the dealer. The dealer will check to see if they have pontoon by peeking at their cards, which will result in all wagers and cards being collected if they do. This is also known as a natural hand. Once each player has finished with their hand the dealer will reveal their two cards, and will continue to hit until a total of 17 or more. However if it is a soft 17, where there is a possibility of not busting, say you have a six and an ace for example, then the dealer must hit, while they can stand with any five-card hand. Winning players including with a five card trick hand receives a payout of two to one. While every other win see an even money payout and all ties mean the players lose. Basic strategy in blackjack is recommended when playing both at online gaming establishments as well as land-based venues. This is also recommended when playing Pontoon, however the same strategy will not work as the 21 strategy is centred around the fact one of the dealer’s card is revealed. There are Pontoon strategies available which you can search for on the Internet and they take into account how many cards you have in your hand. This is important as you can also get the Pontoon two to one payout with the five card trick. For example if you have four cards and it totals 17, the strategy suggests to hit, while if you have three cards with 17 it advises you to stand. These can come in handy when you are just starting out, so it might be worthwhile taking your time and doing the research. With both blackjack and Pontoon available at many online casinos, which one should you choose? Most online blackjack games have a payout of three to one, so pontoon wins in that respect, while the payout also applies for the five card trick which gives you more chances to win. However, both of the dealer’s cards are face down meaning it can be harder to figure out what your move should be, whereas blackjack sees one card revealed allowing players to determine their next move. Additionally, in pontoon all ties are won by the dealer. At the end of the day, both have their advantages and both have their disadvantages so it can ultimately come down to what you as a player prefer in a game. The house advantage depends ultimately on the game rules, however the Pontoon titles we played saw house edges from 0.38% to 0.39% depending on the software provider. Every rule effects the house advantage however. For example, when splitting and a player receives 21 the house edge is elevated by approximately 0.49%, while it is lowered by around 0.47% when the dealer stands on a soft 17. If Pontoon is played with just two decks instead of eight, the house edge is raised by 0.35%, which could be due to the fact that with more decks it is a lot easier to create five card tricks in pontoon. Australian players who are ready see how pontoon compares to blackjack cannot not legally play the game online as of September 2017. The above information is intended for international readers only. Australians may find the variant at land-based casinos. International players can find the game at Internet casinos, which even offer additional variations of pontoon too. You will find the pontoon titles under the blackjack or table games category at your chosen online casino. Royal Vegas Casino Royal Vegas is one of the oldest casinos on the Web. 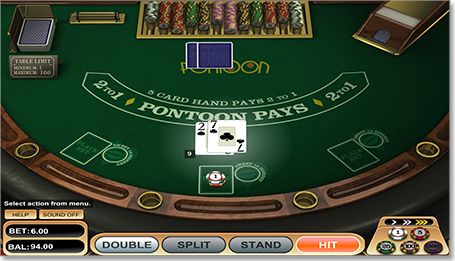 This Microgaming-powered casino has several different types of pontoon games on both their downloadable platform and instant-play versions. All new customers at Royal Vegas get up to $1200 in deposit bonuses. Guts Casino Guts has an incredibly low minimum stakes limit on one of their two pontoon titles, with the smallest bet made being just 10 cents. This is great for players who are just starting out with pontoon. Guts give all new players up to $400 in bonus bets and 100 free spins on Starburst slot machine. Wherever you play pontoon, ensure the site has a stellar reputation and is regulated by an independent gambling body to make the most of your online gaming experience.